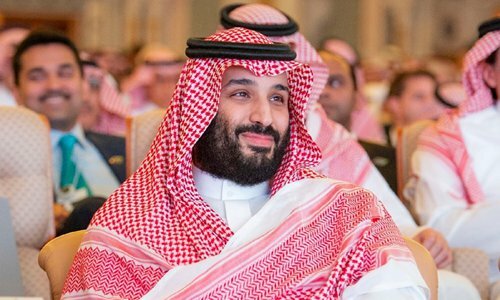 Saudi Arabia Crown Prince Mohammed bin Salman bin Abdulaziz Al Saud is scheduled to visit China from Thursday to Friday after his trip to Pakistan and India, in a sign that Chinese observers said shows the kingdom is seeking to diversify its diplomacy rather than merely rely on the US. Two major powers in the Middle East - Saudi Arabia and Iran - are trying to deepen cooperation with China, and this shows that the countries in the region welcome China's participation in solving problems in the region, experts said, as the Iranian foreign minister and the parliament speaker met their counterparts in Beijing on Tuesday just two days ahead of the visit of the crown prince. At the invitation of Han Zheng, a member of the standing committee of the political bureau of the Communist Party of China Central Committee and vice premier of the State Council, the crown prince, who is also deputy prime minister and minister of defense of Saudi Arabia, will visit China from Thursday to Friday, the Xinhua News Reported. During his visit, President Xi Jinping and Vice Premier Han Zheng will meet the crown prince respectively, and the two sides will sign a series of cooperation agreements, Chinese Foreign Ministry spokesperson Geng Shuang said on Friday, announcing the visit. Vice Premier Han Zheng and the prince will co-chair the third meeting of the China-Saudi Arabia High-Level Joint Committee. Geng said that through this visit, "we look forward to further strengthening the China-Saudi Arabia comprehensive strategic partnership, building greater synergies between our development strategies, deepening cooperation in various sectors under the framework of the [China-proposed] Belt and Road Initiative and having an in-depth exchange of views on international and regional issues of common concern, to achieve greater progress in China-Saudi Arabia relations." "There is a shining point in the crown prince's visit to Pakistan, which is seeking cooperation with China in a third country [Pakistan]," said Ding Long, a professor at China University of International Business and Economics in Beijing and an expert on Gulf countries. Saudi Arabia's large investment in Pakistan will boost construction of the China-Pakistan Economic Corridor, Ding told the Global Times on Wednesday. During the crown prince's visit to Pakistan, Saudi Arabia and Pakistan signed investment cooperation agreements amounting to $20 billion. Saudi Arabia will also set up an oil refinery and petrochemical complex in Gwadar where China is already undertaking mega projects. Geng said at Tuesday's press conference China was "glad to see" cooperation between Pakistan and Saudi Arabia. Saudi Arabia is still facing some diplomatic challenges over the murder of dissident journalist Jamal Khashoggi, leading some Chinese observers to note that the prince is trying to improve the external environment for his country. But even without the impact of Khashoggi's sensational killing, Saudi Arabia would try to strengthen its ties with non-Western countries like China and India sooner or later, as these fast-growing economies are major oil customers, said Ding. The US, Saudi Arabia's most important ally, is trying to reduce its presence in the Middle East and also trying to reduce its energy reliance on Gulf countries and so even if the Khashoggi issue didn't affect US-Saudi ties, the kingdom would seek to diversify its diplomacy through strengthening ties with China and India, said Ding. Before the crown prince's visit, a delegation of senior officials from Iran, a major Saudi rival in the Middle East, visited China. On Tuesday, Chinese State Councilor and Foreign Minister Wang Yi met Iranian Foreign Minister Mohammad Javad Zarif, who was accompanying Iranian parliament speaker Ali Larijani on a visit to China. At the meeting with Wang on Tuesday, Zarif said the Iranian side welcomes China's more important role in issues concerning the Middle East region such as Syria, Iraqi reconstruction and the peace process in Afghanistan, Xinhua reported. Both sides also exchanged views on the Iranian nuclear deal, said Xinhua. Hua Liming, a Middle East studies expert and a former Chinese ambassador to Iran, told the Global Times on Wednesday that "although Iran and Saudi Arabia are hostile toward each other, China always keeps friendly and stable ties with both. This is very unique among the major powers of the world." The US, Russia and European countries normally pick sides among Saudi Arabia, Iran and Israel when they intervene in Middle East affairs, but China is the only country that refuses to choose sides, Hua noted. That's why countries in the region always urge China to mediate, he said. With the growth of China's influence and its increasing overseas interests, Beijing will consider using its unique advantage to try to mediate in Middle East conflicts and, if it can, successfully solve some problems. Its influence and image in the region, as well as with the whole international community, will be greatly improved, Hua said. China is already mediating in Yemen, where Saudi Arabia and Iran are having an indirect conflict. Ma Zhaoxu, China's permanent representative to the United Nations, on Tuesday urged the international community to push the Yemeni parties to sustain effective political dialogue, Xinhua reported on Tuesday. "We should push the Yemeni parties to sustain effective political dialogue and negotiation," Ma said at a Security Council meeting on the situation in Yemen.